Quote of the Day: Should Obama Call Romney a Liar? It seems pretty clear that their new strategy is basically just call us liars. from LA to Boston is about 3,000 miles, so to take only 15 hours would require an average of 200 miles per hour. Certainly other road trips are possible — but the particular one proposed here is not. The Obama campaign might put ads out that say Romney wants to speed or is going to speed. Romney’s campaign might respond by saying the study is a “joke” and “partisan,” that he supports speeding laws and would never, ever speed, and it is ridiculous to suggest that he would. The Romney campaign and its surrogates might say that the analysts must be wrong because they don’t even know what his road plan is or which car he would drive. Besides, Romney never really said he wanted to go LA, he might want to go somewhere closer; he could get to LA without speeding if he took more than 15 hours; he could get somewhere else in 15 hours without speeding. And so on. With a few substitutions, this is almost exactly how the tax debate has evolved….Romney can’t do all of the tax cut proposals he has advocated, remain revenue neutral, and avoid taxing households with income below $200,000 or cutting taxes for higher income households. Let me translate: Romney is lying about his tax plan and he knows it. When he’s called on it, however, he turns around and smears the folks who pointed out his lie. #2: And the fact is that if you are lowering the rates the way you described, Governor, then it is not possible to come up with enough deductions and loopholes that only affect high-income individuals to avoid either raising the deficit or burdening the middle class. It’s — it’s math. It’s arithmetic. #3: It just reminds me of, you know, he says that he’s going to close deductions and loopholes for his tax plan. That’s how it’s going to be paid for, but we don’t know the details….And at some point, I think the American people have to ask themselves, is the reason that Governor Romney is keeping all these plans to replace secret because they’re too good? Is it because that somehow middle-class families are going to benefit too much from them? Could Obama have done more? Maybe a little. But there are really only two ways he could have been substantially more effective. The first would have been to somehow hammer home the math. Color me skeptical that there’s any way to do that for your average undecided voter, who can probably balance his checkbook but not much more. They’d zone out almost instantly. The second way is to just call Romney a liar to his face. But the conventional wisdom says you can’t do that. It’s too negative and voters don’t like it. Personally, of course, I think it would be fascinating to watch Obama buck that conventional wisdom and flatly accuse Romney of lying, followed by a challenge to Romney to prove him wrong by laying out a set of deductions that will cover his 20% rate cuts. Fascinating! But it’s also the kind of pipe dream that only bloggers can indulge in. In reality, no matter how satisfying it might feel, the conventional wisdom is probably right. It would hurt Obama, not help him. Why? Because one of the weird aspects of American politics is that voters, no matter how cynical they claim to be, basically accept politicians at their word when they make concrete promises. 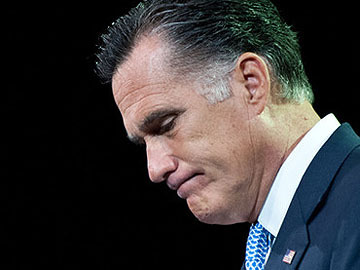 Romney says he won’t raise middle class taxes? Then he won’t. Romney says his plan won’t increase the deficit? Then it won’t. The fact that it might be mathematically impossible doesn’t seem to carry any weight. It’s all just confusing numbers, after all. What matters is whether you think Mitt Romney would look you in the eye and tell a bald lie. Most people don’t, and unless you’ve literally got a secret video with smoking gun evidence proving otherwise, they consider accusations of lying to be playground level mudslinging. Maybe that’s weird. Maybe that’s unfair. But it’s reality, and it’s a pretty good deal for Mitt Romney.